With 2018 setting a record for the highest annual number of school shootings the United States has ever experienced, LCHS is changing its outlook on school security with the help of Chameleon Associates, an internationally recognized security service. During the first and second weeks back from semester break, Chameleon representative Peter Crabbe conducted grade-by-grade assemblies, during which he educated students on our new proactive method of security. 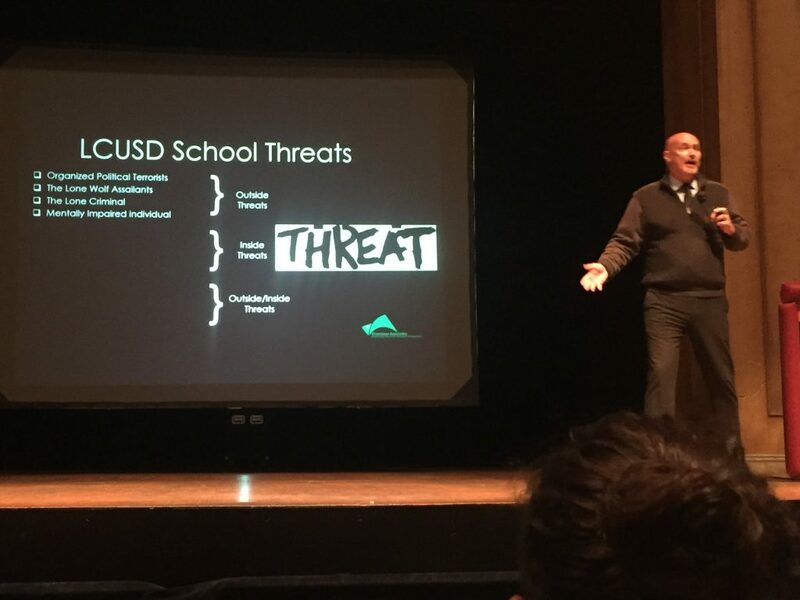 The assembly included an explanation of the Israeli Security Model, which is focused on detecting pre-attack behaviors in possible shooters in order to stop potential shootings before they happen. This includes paying attention to what people say and do in order to notice and report suspicious behavior. Mr. Crabbe emphasized the important role that students play in this model, as they are most familiar with what is normal and abnormal at school. He also talked about how to react in the event of an active shooter. In such a case, it is essential to follow the OODA loop: observe, orient, decide, and act. This is to help you think clearly and react rationally to such a situation. Also, time and distance are most critical, and creating both between yourself and the shooter should be your number one priority. In the case of a lockdown, it’s important to barricade the door and stand clear of it. According to Mr. Crabbe, no active shooter has ever killed a person hiding behind behind a locked door or running off site, and so both of those actions are logical options if possible. However, a lot of students weren’t incredibly impressed with the assembly, many feeling that the information presented was fairly straightforward. Not all reactions were negative, however.